Eddie Giacomin was impressive in his first month as Rangers goaltender, but faltered thereafter, and lost his starting job in New York. The following season he improved markedly, leading the NHL in shutouts and backstopping the Rangers to only their second playoff berth in nine seasons. A classic stand-up goaltender and a skilled stickhandler known for leaving the crease to play the puck, Giacomin would be the Rangers' starting goaltender for the next nine seasons, leading the league in games played four straight years from 1967, in shutouts in 1967, 1968 and 1971, and sharing the Vezina Trophy with partner Gilles Villemure in 1971. 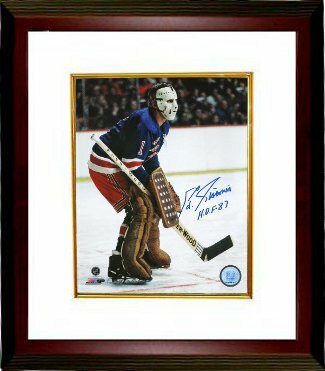 Eddie Giacomin has hand signed this New York Rangers 16X20 Color Photo with HOF 87 inscription. MAB Hologram and Certificate of Authenticity from Athlon Sports. Custom White Mat and Premium Mahogany Color Framed as shown.